Now I have to say that I don’t have this item, but I wish I did, and anyone with a toddler might say the same thing. I can’t tell you how many times the baby has strolled into the kitchen while I’m cooking, and dad, bless his soul, does make an effort to stop her, but she keeps coming. 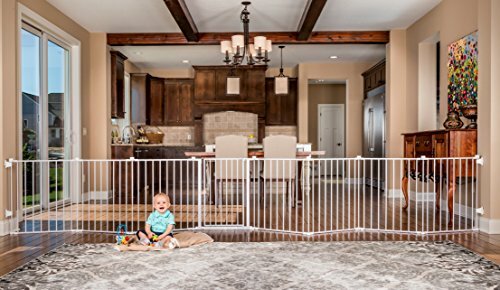 We have a big entrance from the dinning room into the kitchen so a normal safety baby gate won’t cut it, not by a long shot, but this thing would certainly do the trick. And it’s mobile and flexible so you can use it in any part of the house you need. This one is definitely on my list of useful purchases and the online reviews are great. People are using it for their pets, not just their kids, so it has multiple uses. I guess after you no longer need it for the kids, you can use it for animals and other things, so you really get your money’s worth out of it. And it’s a two-in-one kind of product. It acts as a gate and as a confined play area so you can keep an eye on the baby while we’re doing our thing. It also looks like it folds down into an easy to carry small unit, it’s made out of steel so it’s durable, so the overall looks good. So in our house, the areas of concern are the kitchen, two sets of stairs and the fireplace, and there are lots of times when we just want to contain or coral her so we can keep an eye on her while we cook or are otherwise busy. This may not be one of those purchase like a bottle warmer and a diaper pail that you use every day and depend on, but I’m telling you, I can see this thing saving anyone lots of frustration trying to keep the baby out of the kitchen or other problem areas. So even though I don’t have this one, I can firmly say that this is one I will purchase and that I would recommend, especially based on the reviews. If anyone reading this does purchase it, please feel free to contact us and tell us about your experience with it. Keep toddlers out the kitchen while you cook, and keep them out of other problem areas in the house. SAFETY: Designed with safety-lock, meets all safety standard. Hardware mount for added security. Perfect for children 6-24 months. Great for PETS TOO! 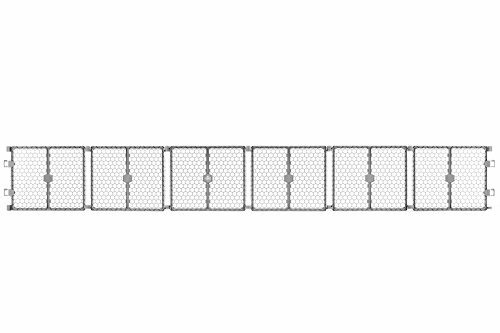 6-Panel Play Yard expands to become a 144-inch wall mounted gate. The super wide gate can be expanded to fit openings up to 144 inches wide and comes with six, 24 inch panels. Includes 6 removable and configurable panels that enclose 19 sq. feet. The panels connect to hinged posts that offer an amazing variety of shaping possibilities. Easily mounting to the wall, the convenient gate features a walk-through door designed with a double lock lever handle allowing adults to easily pass through. It is ideal as a play yard, fireplace barrier, at the landing of stairs, or a super gate for very wide openings. Convenient walk through design with safety locking feature. Folds down for easy set up and storage.